DOJ's inspector general has finished a draft report tied to the 2016 election. On Tuesday morning, President Donald Trump complained of "numerous delays" in the release of Horowitz's final report, which is expected to run several hundred pages long and be released in the coming days. The sources who spoke to ABC News were willing or able to address only a portion of the draft report's complete findings. There is no indication the president has seen – or will see – a draft of the report before its release. Horowitz, however, could revise the draft report now that current and former officials mentioned in it have offered their responses to the inspector general's conclusions, according to the sources. Almost from the start, the long-awaited report was expected to chastise Comey for his handling of the Clinton-related probe. But in apparently describing Comey's defiance of authority, the draft report was criticizing a man who prided himself on his leadership style at the FBI and has since dedicated his post-government life to promoting a new generation of effective leaders. In an interview in April, ABC News Chief Anchor George Stephanopoulos asked Comey: "If Attorney General Lynch had ordered you not to send the letter, would you have sent it?" "No," Comey responded. "I believe in the chain of command." Horowitz's draft report cited Comey for failing to consult with Lynch and other senior Justice Department officials before making his announcement on national TV. While saying there was no "clear evidence" that Clinton "intended to violate" the law, Comey insisted the former secretary of state was "extremely careless" in her "handling of very sensitive, highly classified information." "I have not coordinated or reviewed this statement in any way with the Department of Justice or any other part of the government. They do not know what I am about to say," Comey said before cameras on July 5, 2016. (Andrew Harnik/AP Photo) Attorney General Loretta Lynch speaks at a news conference at the Justice Department in Washington D.C., Sept. 22, 2016. Comey has defended his decisions as director, insisting he was trying to protect the FBI from even further criticism and "didn't see that I had a choice." More than a year ago, as lawmakers increasingly voiced concern over how the FBI and Justice Department handled matters surrounding the 2016 election, the inspector general's office announced that it had launched an investigation into an array of allegations, including an allegation "that Department or FBI policies or procedures were not followed in connection with, or in actions leading up to or related to, the FBI Director's public announcement on July 5, 2016." A week before the announcement, while the investigation into Hillary Clinton was still underway, a political firestorm erupted in Washington after Lynch happened to run into Bill Clinton in Arizona and briefly met with him inside a plane sitting on a tarmac there. Days later, with questions swirling over whether Bill Clinton tried to improperly influence the investigation into his wife, Lynch haphazardly announced that she would not recuse herself from the matter but would "fully expect to accept" whatever recommendation the FBI made. Comey later called it a "tortured half-out, half-in approach." And after such a "strange" announcement, "I decided I have to step away from her and show the American people the FBI's work separately," Comey told ABC News. 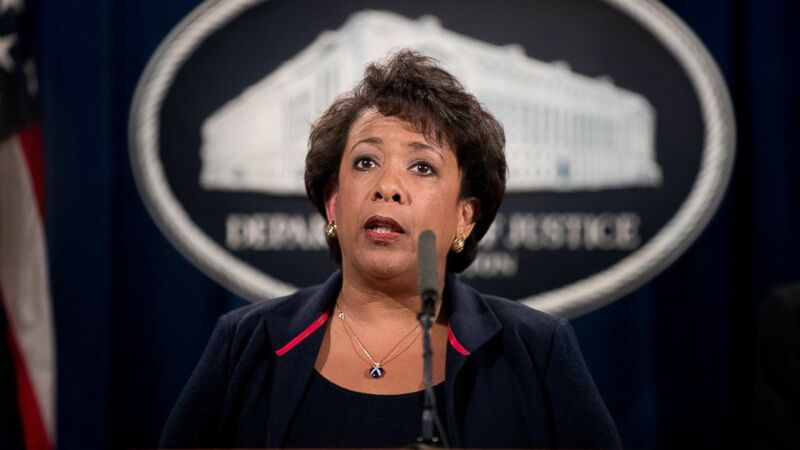 The inspector general's office seemed to similarly view Lynch's announcement as strange, with the draft report criticizing her for how she handled the impromptu tarmac meeting and its aftermath, according to sources familiar with the findings. In April, when Comey was promoting his new book "A Higher Loyalty," Lynch issued a statement saying that during the Clinton email investigation she "trusted" the "non-partisan career prosecutors" handling the case "to assess the facts and make a recommendation -- one that I ultimately accepted because I thought the evidence and law warranted it." Nevertheless, ABC News has confirmed that Horowitz's draft report went on to criticize senior FBI officials, including Comey and fired FBI deputy director Andrew McCabe, for their response to the late discovery of a laptop containing evidence that may have related to the Clinton investigation. That discovery prompted the FBI's letter to Congress announcing the reopening of the Hillary Clinton email probe. Hundreds of thousands of emails had been found on the laptop of disgraced former congressman Anthony Weiner, whose wife, Huma Abedin, was a top aide to the secretary of state. It took weeks for the FBI to start analyzing the laptop's contents, and Horowitz's draft report criticized senior FBI officials for how long the laptop languished inside the bureau, sources told ABC News. McCabe was fired from the FBI in March, after Horowitz concluded in a separate report that McCabe "lacked candor" when speaking to internal investigators about his role in a disclosure to the media. The matter has since been referred to the U.S. attorney in Washington for possible prosecution, and McCabe's legal team is now seeking a grant of immunity from lawmakers who want him to testify before a Senate panel about Horowitz's findings. Talking with ABC News about his own firing, Comey said he decided to write a book afterward because, "It occurred to me maybe I can be useful by offering a view to people, especially to young people, of what leadership should look like and how it should be centered on values." ABC News was unable to ascertain information about another key part of the inspector general's report: whether animus toward Trump may have influenced the FBI's investigation of Hillary Clinton's emails or the subsequent probe of Russian meddling in the 2016 election. FBI senior agent Peter Strzok and FBI attorney Lisa Page exchanged hundreds of messages in the lead-up to the election, including messages calling Trump "an idiot" and saying the Republican Party "needs to pull their head out of their" rear-ends. The messages also included critiques of Hillary Clinton. "There are so many horrible things to tell, the public has the right to know. Transparency!" Trump said in his Twitter message on Tuesday. Representatives for Comey, Lynch and McCabe declined to comment for this article. A spokesman for the inspector general's office also declined to comment.